This is a wonderful site. Please visit and read all she has to say. This is just a quick note to let you know we will share information about Clay Aiken’s speech at the Human Rights Campaign as we get reports. Please remember that these are all from someone’s eyes. None of the Red reports are anything but a report from a phone call. Clay is the second speaker after the dinner. They are on the salad course and giving out some awards as they eat! Clay has a guest with him tonight – Reed is there. Clay is wearing a dark suit and is looking very handsome! No matter how people try to stop us they won’t succeed because our side is the side that is right & fair. We’re moving the ball down the field. Great idea to post the red reports here. I just listened to the speech and he was so good, articulate, funny, and right on point. Clay Aiken should deliver more speeches. Meredith Baxter was outstanding. I haven't heard her yet, but I have been reading the excerpts. Clay Aiken was amazing. Wonderful speech – very heartfelt, funny and uplifting!!! I'm so glad he wrote his own speech – he can tell his story better than anyone. You go Clay!!! Loved his speech. Very sincere. He really is a great speaker. Amazing, inspiring speech right on topic. Good job Clay Aiken!!! Clay is one guy who doesn't need a speech writer. I listened to the speech and The people there were also enjoying it. Clay Aiken is a natural communicator. Enjoyed Clay Aiken's speech very much. Off to go find Meredith Baxter's speech now. I am so proud of Clay… I think the stars are aligning for this fine young man…. 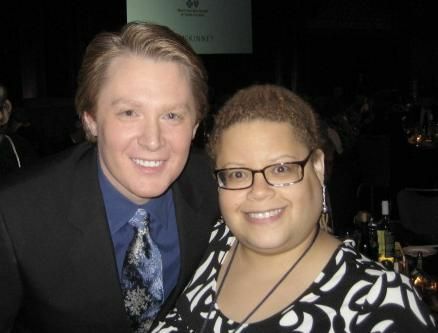 Have not heard the speech yet, but Clay Aiken is very articulate and I am sure the speech was great! Clay is such a natural in front of a crowd. His speech was heartfelt and sincere. Love ya, Clay! I am so happy that Clay feels free to be himself. It has been a struggle for him and I believe he has found happiness. I am proud to be a fan of such a well spoken, articulate and intelligent man. Oh yes and he can SING! Thank you for the RED reports of Clay Aiken's speech at the Human Rights Campaign Gala in Raleigh tonight. Clay certainly made the point that with every positive step for human rights, "It was about damn time!" As someone said who was there, ""he looks comfortable". I'm happy that Clay Aiken is in that good place. Thank you, thank you, thank you for the coverage of this event. I am so proud to be a fan of Clay Aiken. What a wonderful speech and Clay Aiken looked so comfortable. I loved the fact that he wrote the speech himself. Thank you CANN for posting the wonderful video. Thank you for posting the video of Clay's speech. Clay did a wonderful job delivering his message. Concise, humorous, well thought out and right on the money. That's Clay Aiken. He is right about one thing…It's about damned time that there are equal rights for every citizen in this country. It's long overdue! Great video. Thanks! What a great speech. I expected Clay Aiken would do a good job and he didn’t disappoint. But then, he never does disappoint – he rises to the occasion every time IMO. What a class act he is. I’m so proud of him!!! I just watched the video and it was so forthright and hopeful. I am so glad that Clay is finally free to be himself. I love what he said about Parker. He is a proud papa. I also agree,everyone should have equal rights…and I hope I see that coming in the near future. What I love so much about Clay Aiken he is a man with CLASS he always knows how to present himself in a very natural way, you can see he is happy with himself. he is free of all the gossip and speculations he had to endure a few yrs. back. I wrote Clay 3 yrs. ago a personal letter (befor he came out ) and said that I feef his personal life is no ones business bud his own I still feef that way. Clays music is what fascinated me in the first place, and still does. CLAY AIKEN IS ONE OF A KIND! !……..A GENTLEMAN…. Error: Error validating access token: Session has expired on Tuesday, 21-Aug-18 16:13:01 PDT. The current time is Thursday, 18-Apr-19 22:02:12 PDT.